With National Day lurking around the corner - only nine days! Where did time go? - it is time to have a look at the extensive tiara collection of the Grand Ducal Family, which not only rivals but surpasses the collections owned by many other European royal families. Keep your fingers crossed that the Luxembourgish ladies will dig deep into the collection for the upcoming gala event and cross them even harder that we will get to see pictures of the event (as that hasn't always been the case in the past). Technically, not all of the following tiaras belong to the Grand Ducal Family. Some of them have belonged to the family - in the sense of the head of the family - since decades, others were gifts to certain members of the family and might have been inherited out of the main line while still others are still owned by individual members or persons associated with them. The only criteria for tiaras to make it into this list was to be available to at least one member of the family. Some of the tiaras might have two names or none at all; in the first case there's usually a mixture of both names used, in the latter case, I tried to come up with names. 1) The Luxembourg Empire Tiara is without a doubt the biggest tiara in the Grand Ducal jewellery box; it might just be one of the biggest pieces in any jewellery box! The provenance of this tiara isn't entirely clear; it has been in the family since at least 1829 and it might have been made by Frankfurt-based jeweller Jakob Tillmann Speltz. Wherever it may come from, this piece seems to be reserved for the use of the Grand Duchess. 2) The Congo Diamond Necklace Tiara was given to Princess Joséphine-Charlotte of Belgium upon her marriage to the Hereditary Grand Duke of Luxembourg by the Belgian colony of Congo. She chose to wear it for her religious wedding, a sample followed by her two daughters and one of her daughter-in-law's. As the name suggests, it can also be worn as a necklace. 3) The Belgian Scroll Tiara, also sometimes referred to as Société Générale Tiara, was yet another wedding gift to Princess Joséphine-Charlotte. (Too bad royals aren't doing wedding gifts these days as they used to!) Given to her by the multi-national Société Générale bank, she wore this sparkler for her official wedding pictures. This tiara became one of Joséphine-Charlotte's favourites throughout her whole life, during the 1990's she lent it to her daughter-in-law Princess Sibilla on a few occassions and to the Grand Duchess after her husband had ascended to the throne. 4) The Chaumet Diamond Pearl Choker Tiara is one of the most versatile pieces in the Grand Ducal Collection. Not only can it be worn as a chocker necklace, there are also no less than six tiara settings. The pearls that we generally see mounted on top these days were originally sapphires. The tiara was manufactured by Parisian based jeweller Chaumet and some say that it might be a dramatic remodelling of a necklace once owned by Grand Duchess Charlotte. 5) The Diamond Floral Tiara is often simply described as the smaller one of the two floral tiaras in the Grand Ducal collection. It is, however, the only tiara still in use with an actual floral motive. Over the last few years, this tiara as become something of a signature piece for Princess Alexandra. It could also be described as the Habsburg wedding tiara as it has been worn by both Archduchess Marie-Christine and Archduchess Adélaïde on their wedding days. 6) The Diamond Leaves and Berries Tiara or Diamond Vine Leaves Tiara or the bigger one of the two floral tiaras, once was a Grand Ducal wedding tiara itself. All of Grand Duke Jean's sister opted to wear this sparkler on their respective wedding days. Contrary to popular belief, the tiara does not feature a floral motive but rather leaves and berries. It is one of the favourite pieces of Grand Duchess Maria Teresa and was the first Grand Ducal tiara to ever adorn Hereditary Grand Duchess Stéphanie's head. 7) The Sapphire Bandeau Bracelet Tiara was gifted to Princess Joséphine-Charlotte of Belgium upon her wedding by the Belgian nobility. The tiara is quite versatile as well as it can also be worn as a bracelet and the central motif can be removed to be worn as a brooch. The tiara was an especially popular piece for Princess Marie-Astrid and Princess Margaretha when they were younger and regularly participated in tiara events. It was last worn by Princess Margaretha during the Luxembourgish state visit to Belgium in 2007. 8) The Sapphire Necklace Tiara was only worn by Grand Duchess Joséphine-Charlotte as such. It was most recently worn by Grand Duchess Maria Teresa as a necklace during the gala event of the Monégasque wedding in 2011. The piece may have originated with Grand Duchess Hilda of Baden who was a daughter of Grand Duke Adolph (born and married while he was still only Duke of Nassau). 9) The Grand Duchess Adélaïde Tiara gets its name from its first known owner, Grand Duchess Adelheid-Marie, the second wife of Grand Duke Adolph. The tiara is made of a diamond leaf motif with a large central sapphire that can also be removed. An additional element can be added to the bottom of the tiara; Grand Duchess Charlotte, for example, liked to add an extra strand of diamonds. 10) Princess Margaretha's Sapphire Necklace Tiara does not technically belong to the Grand Ducal collection as it seems to be privately owned by the princess but we will include it anyway. The tiara is, in fact, a necklace made of diamonds and sapphires that can also be worn as a tiara. As a necklace, this piece can often by spotted on Princess Margaretha for all kinds of events that require some bling. 11) The Sapphire Art Deco Tiara includes an enormous cabochon cut sapphire as its central piece that can also be removed and worn as a pendant. Grand Duchess Joséphine-Charlotte wore this piece as a tiara for a number of times and it is said to have been personal property of her's. Grand Duchess Maria Teresa has yet to wear it is a tiara though she occasionally wears it as a necklace, for example at last year's state visit to Norway. 12) The Aquamarine Bandeau Tiara is made of large aquamarines interspersed with diamonds. Originally made for Grand Duchess Joséphine-Charlotte, it is part of a parure that also includes a necklace and earrings. It was last worn by Princess Margaretha at the pre-wedding ball of her nephew Hereditary Grand Duke Guillaume. 14) The Emerald Art Deco Tiara is an art deco piece manufactured by Chaumet in 1926 and said to be a gift from Prince Felix to his wife, Grand Duchess Charlotte. Sometimes nicknamed the Wonder Woman tiara due to its shape, it's probably the hardest piece to pull off in the entire collection that is still regularly worn. 15) The Emerald Peacock Tiara is a convertible piece created by Van Cleef & Arpels after Grand Duchess Joséphine-Charlotte had given them two pendants to manufacture a new piece. It can also be worn as a necklace. To this day, Grand Duchess Maria Teresa has only worn it once on a state visit to Portugal, it was last seen publicly when Princess Marie-Astrid wore it for Hereditary Grand Duke Guillaume's pre-wedding dinner. 16) The Citrine or Topaz Tiara - nobody in the public knows exactly what it is made of - seems to have been brought into the family by Grand Duchess Joséphine-Charllote. At least, it first surfaced on her head during a state visit to Italy in 1980 and was worn by then Hereditary Grand Duchess Maria Teresa during the early years of her marriage. It then vanished for many years until it resurfaced on the head of Princess Margeretha during her parents' state visit to Belgium in 1999 only to vanish again. In 2011, Princess Alexandra wore it for the National Day Gala and Grand Duchess Maria Teresa got it out of the vaults again to wear it during the 2012 state visit to Germany. It was most recently worn by Hereditary Grand Duchess Stéphanie at the wedding of Princess Madeleine of Sweden. 17) The Amethyst Tiara is one of those many mystery pieces in the Grand Ducal Family which are going to follow. So far, it has only been worn once by Grand Duchess Maria Teresa and consists of a number of rectangular amethysts set in gold with a very small white gemstone set at the center of each of the gold crisscrosses. The necklace worn with the tiara in the photo above (17) is part of the Oval Amethyst Parure (19). 18) The Oval Amethyst Parure which was regularly worn by Princess Marie-Astrid and Princess Margeretha in the late 1970's and early 1980's, during the 1980's then Hereditary Grand Duchess Maria Teresa also sported this tiara on a few occasions and it hasn't been seen often recent years. 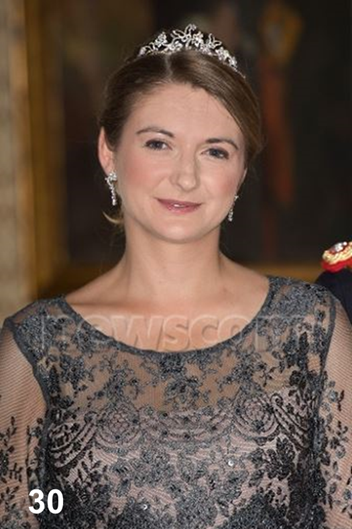 It was the tiara that Hereditary Grand Duchess Stéphanie wore for her first National Day gala (2013). The amethyst are set in gold and separated by either six seed pearls or six semi-precious white gemstones and three pearls or gemstones separate the amethyst on the earrings. The parure includes the tiara, two necklace possibilities, earrings and a bracelet. Parts of the Oval Parure and the rectangular demi-parure are often worn together. 19) The Turquoise Tiara has been in the Grand Ducal Family for a long time but seems to only have been dusted off by Grand Duchess Maria Teresa in more recent years. Presumably made in the 1830's, the tiara, which is part of a parure, has also been worn by Princess Tessy for the National Day gala in 2010. 20) + 21) The two settings of the Diamond Art Deco Tiara owned by Princess Sibilla make it look as if these pictures show two totally different pieces though the magic behind the story is that the top half of the larger setting (21) can simply be removed to create the smaller setting (20). Some say that the tiara was a gift by Princess Sibilla's father Paul-Annik Weiller upon her wedding. Though there does not seem to be any doubt who the benefactor was, it seems more likely that she received it a few years into her marriage as a) she did not wear a tiara on her wedding day and b) she used to borrow tiaras from her husband's family for her first few tiara appearances. 22) Queen Victoria Eugenia's Aquamarine Tiara shows that Princess Sibilla does not only come from a seriously rich family but that she has quite some royal ancestry herself. Once owned by Queen Victoria Eugenia of Spain, a granddaughter of Queen Victoria of the United Kingdom, it now belongs to her granddaughters Donna Sandra and Donna Olimpia Torlonia di Civitella-Cesi, the latter being Princess Sibilla's mother. The tiara was worn by Princess Sibilla on the occassion of the pre-wedding gala dinner of the Hereditary Grand Ducal Couple. 23) Princess Joan's Diamond Tiara is a diamond tiara owned by the late Prince Charles' wife née Joan Douglas Dillon. The tiara is said to have been a gift by her father, former U.S. Treasury Secretary Clarence Douglas Dillon, and she frequently wore it to tiara events during her marriage. Charles and Joan's daughter, Princess Charlotte wore the tiara on her wedding day in 1993. 24) The Lannoy Family Tiara is owned by the family of Hereditary Grand Duchess Stéphanie. All of her sisters and sister-in-laws wore the tiara for their respective weddings and so it is no surprise that the born Countess de Lannoy opted to wear this family heirloom for her big day. 25) It is not even certain that this Floral Button Tiara worn by then Hereditary Grand Duchess Maria Teresa even is an actual tiara. Whatever it is exactly, it was only seen in this fashion once during the 1980's at a pre-wedding ball in Germany. The buttons might have been taken from a necklace that the Grand Duchess wore on a few occassions. 26) The Golden Bandeau Tiara, or maybe more tiaras with a very similar look, made the rounds on the heads of Grand Duchess Charlotte and her sisters during the 1910's and 1920's. There seems rather sparse workmanship put into this piece as it looks like a plain golden bandeau with one single stone. 27) The White House Tiara - what a name! - used to be one of the big tiara mysteries in the Grand Ducal collection. The above picture, which is one of the few that there is available online, was taken on 30 April 1963 during a state visit to the United States of America by Grand Duchess Charlotte and Hereditary Grand Duke Jean. The tiara was once owned by Grand Duchess Hilda of Baden, Charlotte's aunt who left her some jewels. 28) The Floral Bandeau Tiara is another tiara that has been worn by Grand Duchess Charlotte during her younger years. What appears to be a diamond tiara with a floral motif, can also be worn the other way round and hasn't been seen in a loooong time. 29) Joséphine-Charlotte's Danish Wedding Tiara was worn by then Hereditary Grand Duchess Joséphine-Charlotte at the wedding of then Princess Margrethe of Denmark, today's Queen. The tiara is of unknown provenance and hasn't been (publicly) worn since that day in 1967. It seems to be a rather high tiara with a floral motif. As the necklace that Joséphine-Charlotte is wearing is made of emerald and diamonds, it seems likely that the tiara consists of the same stones. The sisters of Prince Henrik and the President of France and his wife loaned several tiaras to ladies attending the wedding. It is possible that it was a loan. Several other royal women have been forced to borrow tiaras while attending high profile events. The United Kingdom's Queen Elizabeth was forced to borrow a tiara on at least one occasion because the band on her own tiara broke just before the event. Not even royal ladies are known to travel with a "backup taira." Almost 30 tiaras, that's quite a collection. And you know what? That isn't all! We, your faithful bloggers at Luxarazzi, have been told that there are jewels gathering dust in the Grand Ducal vaults since decades because they simply haven't been worn. Oh, how I wish they would get them out! 30) Update: Since this post was originally published in June 2013, there has been a new addition to the Grand Ducal Tiara Collection. For the national day gala 2014, Hereditary Grand Duchess Stéphanie sported a modern tiara featuring a diamond butterfly motif. The cour grand-ducale confirmed that it is a new addition to the collection but did not reveal any further details.